LYNX (Central Florida Regional Transportation Authority): From Central Station, take Link 102 just north of Minnesota Ave in Winter Park. The bus stop is across from Rollins College’s Harold Alfond Stadium. Walk south along Orange Ave. | Street parking is available along Orange Ave and side streets. | Biking and walking are both good for you and pleasant modes of transportation on a Saturday, and anytime! If riding, please wear a helmet and flashing light (and reflective strip if you have one)! And don’t forget your bike lock! OUTSIDER ART FAIR: Timed to coincide with the 51st Annual Winter Park Sidewalk Art Festival™, which draws an estimated 350,000 visitors to downtown Winter Park, Florida, Frames Forever & Art Gallery presents an unjuried art fair featuring the best in outsider art; less than a half-mile away! PETS ALLOWED AND WELCOME! 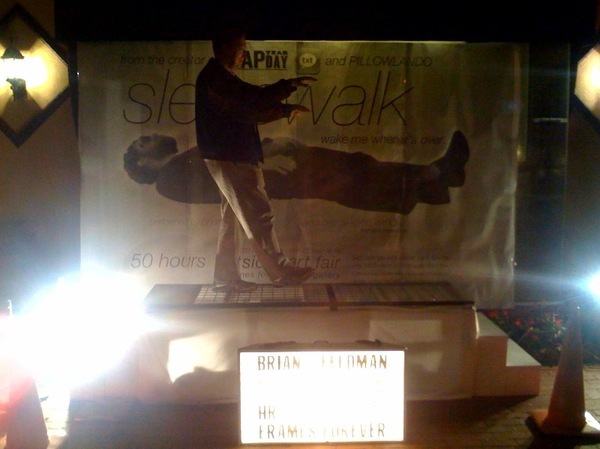 BRIAN FELDMAN PROJECTS is Central Florida’s premiere presenter of experimental time-based art since 2003. Dinners on stage with real life families, leaping off ladders for 24 hours, group tours in Google translated Swedish through IKEA®, smiling through the pain – this is what we do. Upcoming projects include Happiness Hurts (1 Apr 2010), PILLOWLANDO MMX (3 Apr 2010) and 67 Books (11-17 Apr 2010). This entry was posted in Orlando theater, Performance art and tagged brian feldman, outsider art fair, sleepwalk. Bookmark the permalink.